We all know Bitcoin is by far and away the largest crypto-currency out there. With a $6.3B market Cap it dwarfs all the others, Litecoin comes in a distant 2nd with $305M. 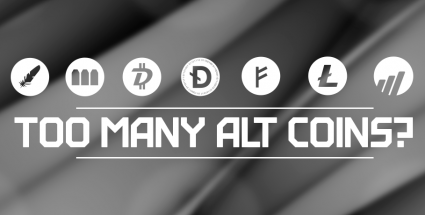 But did you know there are now way in excess of 250 alt coins available and that number is growing every day? You can look at this 2 ways; either it is fantastic innovation as more and more players look to add to the crypto coin industry. There are coins for example dedicated to musicians or to charitable endeavors or specific Countries. Or, to view it the other way, too many alt coins with no real differentiation or strategy just add to the confusion and suspicion the wider community has about our industry. Darkcoin differentiate by focusing on the anonymity of their transactions which are pooled together in the blockchain making them anonymous from the wallet. Litecoins main differentiation was that the hashing algorithm was not SHA256 like Bitcoin but scrypt and the aim was to offer faster transaction times. Another outcome of scrypt was that mining did not need ASICS and could remain more accessible to the everyday user. Many observers now liken Bitcoin and Litecoin to Gold and Silver, both have value and demand, but ultimately Gold will always remain more valued. What about some of the smaller coins that perhaps will never gain wide acceptance? Well the name says it all, dedicated to helping the transacting of Marijuana. Again the name gives it away really, if you like cats you’ll love Catcoin I guess. Its actually a scrypt copy of Bitcoin. A scrypt coin based on Litecoin dedicated to the Flappy birds game. We say bring it on, the more development and innovation that occurs the better. The market as always will determine who the winners and losers are. In fact there is absolutely nothing stopping you developing your own alt coin and releasing it to the world.